Very nice condition, no chips, cracks, or breaks. 4 VINTAGE CUT CRYSTAL SHOT GLASSES MADE IN ITALY ** ELEGANT **. Condition is Used. Shipped with USPS Priority Mail. This one is decorated with bands in orange, yellow, red & black. Hocking line #300. Very fine clarity. A fine addition to your collections! Date: circa 1930. Made by a quality glass firm. A fine addition to your collections. There are dots all around the glass with a ring around the tip. I describe the item the best I can. So the item you see is the item you will receive. VINTAGE STAR ETCHED MARTINI CRYSTAL GLASS NO WHERE TO BE FOUND L@@K! Vintage Beautiful Crystal Small Etched Shot Glass 3 Inch Tall. Vintage Beautiful Crystal Small Etched Shot Glass 3 Inch Tall.. Condition is Used. Shipped with USPS First Class Package. Beautiful set of six clear crystal liqueurs with applied handles. One of the handles has roughness on the inside portion where it was applied to the glass. See close up photo. THIS IS A STUNNING SET HEAVY CRYSTAL. I work hard to identify all issues that I believe you would look for if you could see the item in person. If you are happy we are happy. GREAT ESTATE PIECE NICE TO ADD TO YOUR COLLECTION. 1.7 oz - 50 ml. D - 1 3/4". Vintage Federal crystal shot glasses. Condition is Used. Shipped with USPS Priority Mail. 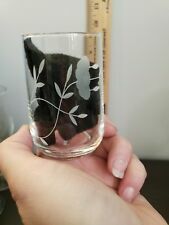 VINTAGE STAR ETCHED SHOT CRYSTAL GLASS NO WHERE TO BE FOUND L@@K! 1950-1960 EARLEY. NO WHERE TO BE FOUND! HAVE 2 SETS! BE THE FIRST 1 TO OWN. 4" HANDLED SHOT GLASS WITH ETCHED DESIGN. Vintage from 70s Amber , Hand Cut Cristal. Shot Glass with “Salviati” Etched Bottom. Size: 1.75” diameter x 2.75” tall hold 1oz. New Condition, No Chips, No scratches, No any kind of damages. SHOT GLASSES. ETCHED FLOWERS. I HAVE TWO IN THE PHOTO BUT IS A SET OF 5 GLASSES. GLASS CRYSTAL. PRODUCT DETAILS. WIDTH: 2-3/4". Genuine LALIQUE FRANCE Crystal Liquor Shot Glass, Signed on bottom. 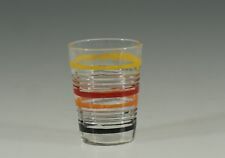 It is clear at the top and has a design pattern on the bottom part of the glass. Review all pictures for item condition. Etched Flowers Crystal Glass Set of 2 Shot Glasses with Low Handles Vintage 4"
Etched Flower. Glasses with Low Handles. Set of 2 Shot. Crystal Glass. "Nice for Display or Use" ! nice classy mix of shot glasses. federal glass and Fly embossed from France. From deep amber to clear, this shot glass is quite heavy. Deep rich amber makes clear almost appear like a light amber in color. Clean with no scratches. For those seldom occassions, I ask for your understanding as things CAN and DO happen. Set of 4 cordial, aperitif, shot glasses with handle. Each is etched with a beautiful double flower design. 4" tall with a low handle. Excellent condition. Set of 2 cordial, aperitif, shot glasses with handle. 4" tall with a low handle. Excellent condition.